Obama aides say Beto O'Rourke reminds them of the ex-president. Obama agrees. Ex-staffers have reached out to the Texas Democrat to offer advice — and encouragement — as he weighs a bid for the White House. WASHINGTON — Rep. Beto O'Rourke may have lost in Texas, but he's winning in Obamaland. Aides to the former president and the man himself say O'Rourke's campaign against Sen. Ted Cruz, R-Texas, gave them flashbacks to Obama's precocious political rise and has positioned the young white congressman as an early if unlikely heir to the first black president's "hope and change" mantle. Obama said as much at an event in Chicago last week and some of his former political lieutenants have been publicly encouraging O'Rourke to consider a 2020 presidential bid, while privately counseling him on what to expect should he jump in. Obama and his coterie are personally closer to any number of other potential candidates, especially former Vice President Joe Biden, and you'd be hard-pressed to find a photograph of Obama and O'Rourke together. Obama didn't even endorse O'Rourke in his Senate campaign. But in O'Rourke, Obama veterans see not only an inspiring political celebrity, but, like Obama, a tactical innovator who eschewed the political industrial complex of pollsters and consultants and used technology in new ways to connect directly with supporters and multiply the force of his fundraising and ground game. "The reason I was able to make a connection with a sizable portion of the country was because people had a sense that I said what I meant," Obama told his former strategist David Axelrod last week, adding that O'Rourke has that same quality. "It felt as if he based his statements and his positions on what he believed. And that, you'd like to think, is normally how things work. Sadly it's not," Obama added. O’Rourke, now back at home and soon to be unemployed when his term in congress ends — he gave up his House seat to run for the Senate — recently changed his tune on a bid for the presidency, opening the door to a possible run. Some in Texas are encouraging him to challenge Texas' other Republican senator, John Cornyn, in 2020, although O'Rourke's family is wary about embarking on another two years of campaigning of any kind. 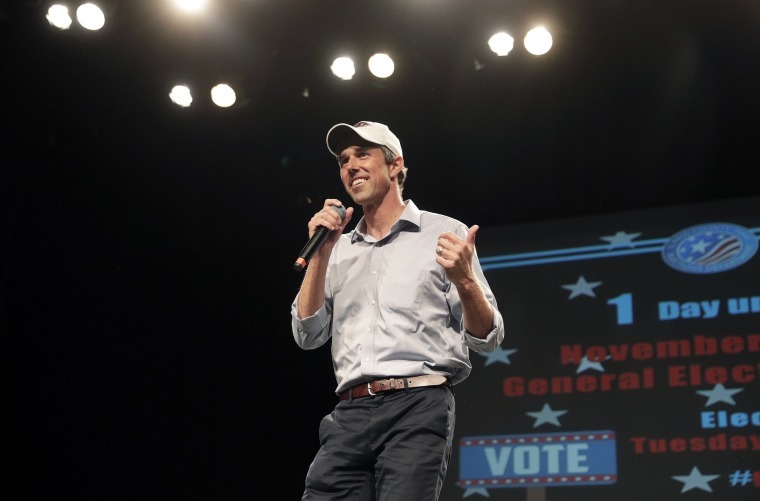 O'Rourke has received invitations to speak to Democratic groups in early presidential states like Iowa and New Hampshire, but has yet to accept them, according to a former senior adviser to his campaign. "We've had a lot of former Obama alumni saying: 'If we can be helpful as you think about this, let us know. If you want our perspective on what it's like to run a national campaign, let us know,'" said the former O'Rourke aide, who spoke on condition of anonymity. And a new group, co-founded by a former Obama field organizer, has sprung up to attempt to draft O'Rourke into the presidential race. "Beto has a special ability — like President Obama did — to make people believe in the best version of America," said Lauren Pardi, who worked on Obama's campaign in New Hampshire. Not everyone who worked in the Obama White House is ready for O'Rourke. Chicago Mayor Rahm Emanuel, Obama's first chief of staff, trashed the Texas Democrat in an interview with MSNBC on Thursday, saying: "He lost. You don't usually promote a loser." As a young El Paso city councilman, O'Rourke broke with the local party establishment — including the congressman he later defeated in a primary — to back Obama over Hillary Clinton in 2008, calling him "very principled and enthusiastic" and an "ideal leader" in an interview with The El Paso Times. And like many other Democrats of his generation, O'Rourke has clearly drawn inspiration from Obama, on everything from mannerisms to rhetoric. "If you look at Obama, if you look at Trump, they both won because they had this kind of rock star appeal ... a kind of viral intensity,” said Craig Smith, a Democratic strategist and longtime adviser to Bill Clinton, who saw from the other side in 2008 as a campaign aide to Hillary Clinton how challenging running against a political celebrity like Obama can be. "I'm not sure who else we've got out there who can run as a rock star." Rock-star status was only the most visible part of Obama's upset victory over Clinton. Another key part was his innovative use of technology, which allowed Obama to continue raising money after Clinton tapped out her large donors and to organize volunteers more effectively. O'Rourke's campaign broke new ground, too, and not only by livestreaming hours of the congressman's travels around Texas. It also put their entire field-organizing plan online, which allowed volunteers to plug into the campaign's system and set up more than 800 "pop-up offices" to supplement the roughly dozen official sites. And like Obama, O'Rourke's record-breaking fundraising was only possible thanks to a recognition of the power of digital fundraising — and the need to invest in it heavily and early — which people involved in O'Rourke's digital program credit to David Wysong, the congressman’s longtime chief of staff and adviser. But like Sen. Bernie Sanders, I-Vt., who also once swore off consultants, O’Rourke would have to hire some if he scaled up a campaign beyond Texas. And there's one obvious and critical difference between Obama an O'Rourke: race. Obama beat Clinton in 2008 by combining the voting power of African-Americans, the most loyal demographic group in the Democratic Party, with that of young white progressives — a coalition that could be especially important given the large number of Southern states on the early presidential primary calendar. Yvette Simpson, who is African-American and the new head of the liberal group Democracy for America, which has just started asking its members about 2020 and is not yet close to making any endorsements, said she would love to see a person of color as the party's presidential nominee, but cautioned not to rule out O'Rourke. "He's clearly not black, you can't change that — he probably wouldn’t want to," she said in jest. "But for a candidate who is not brown or black, he did a really job of engaging brown and black voters in Texas." Dan Pfeiffer, a former Obama White House aide who now hosts "Pod Save America," urged Washington not to count out O'Rourke. "The whole conversation around Beto has been eerily familiar to me, because these are the exact arguments people made to me when I told them I was considering working for Barack Obama 10 years ago," he wrote this week in an essay calling on O'Rourke to run. CORRECTION: (Dec. 2, 5:58 p.m. ET): An earlier version of this article misspelled the name of former Obama White House aide Dan Pfeiffer. His surname is spelled Pfeiffer, not Pfieffer.